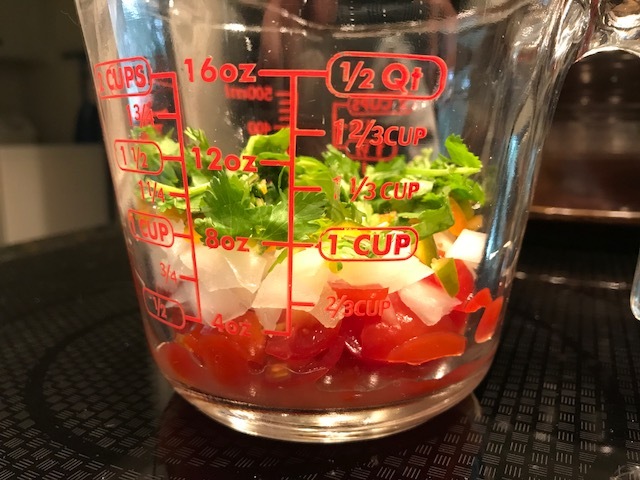 Pequeña means just a little and this recipe makes the right amount for two Pico de Gallo lovers to enjoy with their Tex-Mex dinners. It is easily doubled, tripled, or otherwise increased to make whatever amount you need. Serrano peppers are usually quite hot, but not always. Put a small piece on a taco chip and taste to find out what kind of pepper heat you are dealing with. 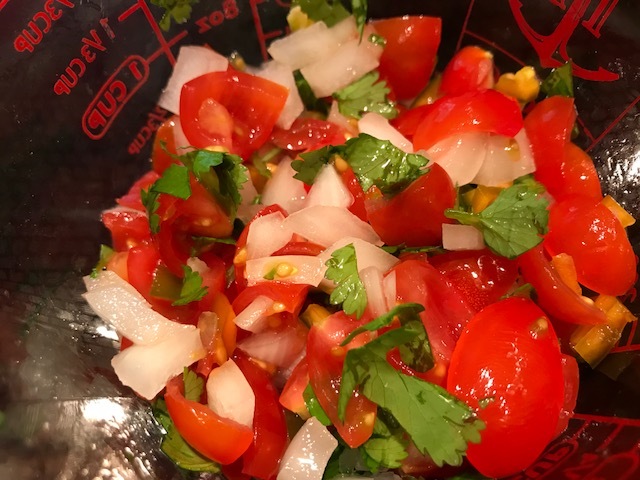 In a glass bowl, combine tomatoes, onion, peppers, lime juice, and cilantro. Leave to sit, uncovered, at room temperature for at least one hour. Then stir, taste, and if you wish to, add more serranos, or adjust the flavor with salt and pepper. We eat it without the salt or pepper which seem to cover rather than enhance the fresh vegetable and herb flavors. But if you like to salt and pepper, add it anyway – I won’t look. Well, I might peek and purse my lips a bit. Do not refrigerate. Tomatoes do not like to be in a refrigerator and will show you their displeasure by altering their flavor. Make it a couple of hours ahead of need and keep it handy. This entry was posted in Sauces, Small batch, Tex-Mex and tagged fast, fresh, Spicy. Bookmark the permalink.